Beer Lane ran from the east end of Great Tower Street to Lower Thames Street. Beer Lane was also known as Bear Lane or Beare Lane. Stow said "At the east end of Tower Street, on the south side, have ye Beare Lane, wherein are many fair houses, and runneth down to Thames Street." 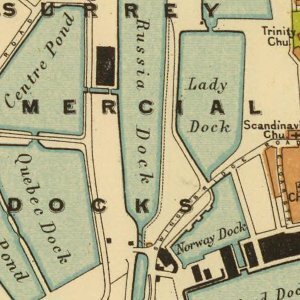 Opposite the River Thames end, stood Bear Quay, used for the landing and shipments of corn. Edward Hatton stated in his 1709 ’A New View of London’: "Here is a very great market for wheat and other sorts of grain, brought hither from the neighbouring counties". The origin of the name is unclear - maybe named after a sign of the bear in the lane or as a way through to Brewers Key.